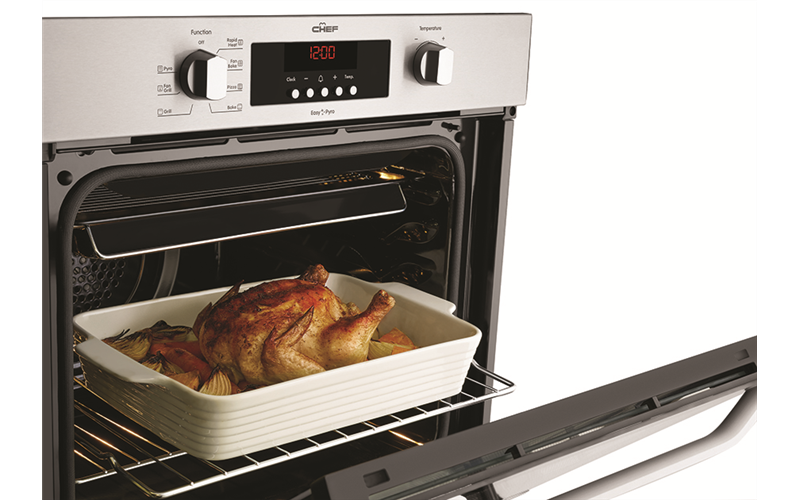 Electric Single Pyrolytic Oven is rated 4.8 out of 5 by 16. At the touch of a button this pyrolytic oven cleans itself, leaving behind only a fine ash, which can be simply wiped away. 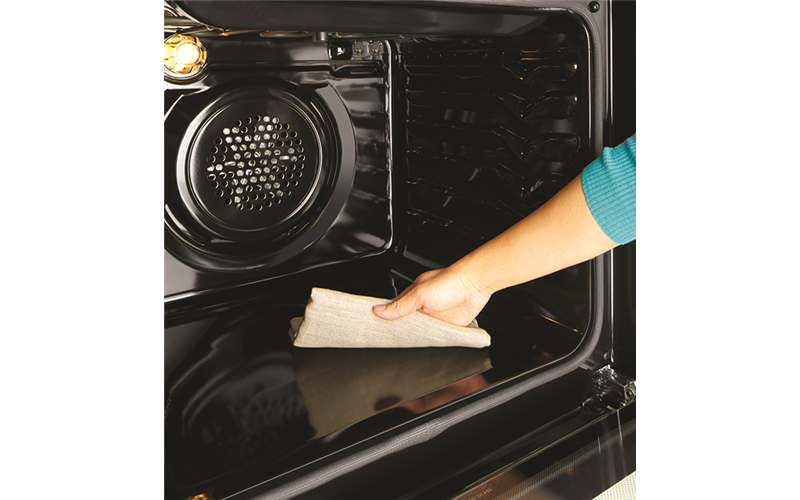 Apart from the cloth for wiping away the ash, no cleaning products are needed. Rated 4 out of 5 by Flipper from Easy to use We have had this oven for about a month and are very happy with it. 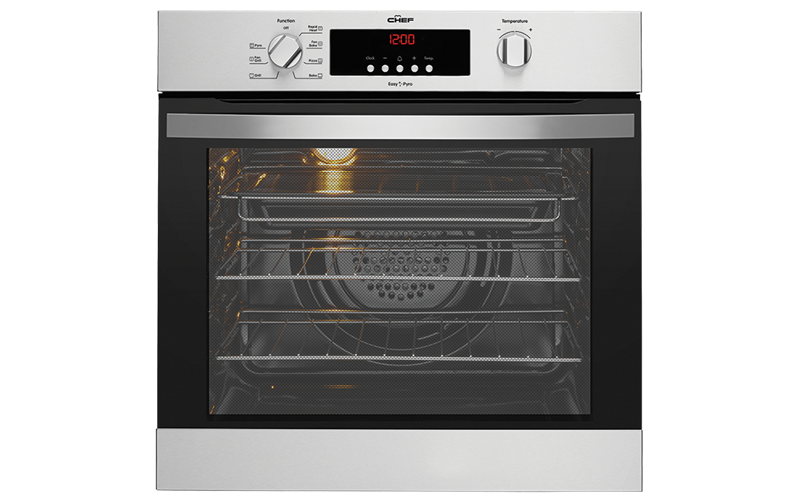 The Chef oven is more even in terms of temperature distribution and more predictable in cooking time than the F&P oven it replaces. It would be nice to have one extra shelf position closer to the floor of the oven to give greater flexibility when cooking. Rated 3 out of 5 by Johnno from You can't steam roast I have always steam roasted and this oven when fan baking and steaming, doesn't bake everywhere, it misses the top of a chicken (no browning). It was recommended I change the setting to another setting so finish the browning. Never had to do that with any other previous ovens. Rated 5 out of 5 by ColinOz from Great oven - easy to use A great buy for under $1000. Haven't tested the Pyrolytic yet, but cooks really well and as it displays the actual temp as well as time in use, it makes it VERY easy to use. Setting the timer is a little fiddly, but once you understand how to do it, it;s quite easy. Rated 5 out of 5 by JLee from Works as advertised! We purchased this because of the interior size, value pricing for a Pyrolytic oven. One nice advantage is you don't need to take outside panels to use the self-cleaning, which to my mind will make it much more likely we'll do it more often. so far so good. Rated 5 out of 5 by leongarthur from Excellent Oven I bought this oven about a month ago and I'm very happy with this purchase. Great oven. Fast heat-up to the desired temperature. The oven has all the functions you need. Look good, very efficient and easy to use. Rated 5 out of 5 by Mandrel63 from Great features Had the new oven a couple of months now and works a treat. Food cooks quicker and much quieter than our old one. Tried the pyrolytic cleaning feature and is very good. Should have got one of these years ago.